A few weeks ago, I posted a what was originally an intended book review of Renato Perdon's new release titled: Learning and Speaking Filipino; however in the process I found myself essentially directing my writeup on the the need for a national language. Consequently and somewhat surprisingly, I received interestingly colorful and informative responses (see under the "Comments" section of the mentioned post). The interesting comments varied from charges/expressions of "hatred" of the Tagalog "race," of Filipino nationalism requiring knowledge of Tagalog, of my espousing fascism, jingoism and Jacobinism to "language colonialism." Such viewpoints, as I see them, reflect our parochial mentality. To make the aforementioned "-isms" charges amuses me: do they(we) really know what these terms meant? These respondents should rethink the borrrowed words they employed, which I suspect were made without much thought. As to our national language, I suggest these fellow countrymen of ours seriously read our 1987 Constitution, to hopefully remind what they should know and understand as to the intent of and sources for establishing our national/native official language. I think that after almost a generation since the adoption of that Constitution, we have failed to work on it mainly for lack of funding -- a by-product of the systemic corruption in our government institutions, courtesy of our rulers. 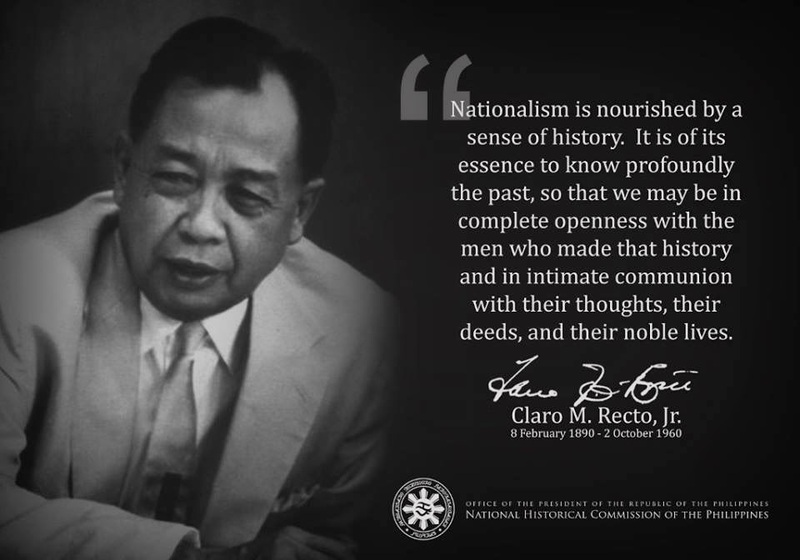 Bottomline, I feel and think that all these comments are mainly based on the misunderstanding of what the concept of nationalism is all about, and specifically of Filipino nationalism in our homeland; which has been extensibly addressed by our heroes and nationalists, in most recent generations by the likes of the Claro M. Recto, Jose Diokno, Renato Constantino, and many other less-known fellow countrymen. Given the much dispersed geographical nature of our homeland, the consequent diversity in our regional languages/dialects and historical animosities (thanks partly to our former foreign masters who practiced "divide and rule"), we have become among ourselves atomized as individual persons, and factional, tribal/provincial/regional in overall outlook in our social and political concerns. Such attitudes and behaviors have contributed significantly to our commonly observed Filipino disunity in the homeland and abroad. The only happy people with our present state of grave disunity are the foreigners and their local partners enjoying our country and patrimony at the expense of the native majority, in the present and in the next generations. Below is an essay by the late Prof. Renato Constantino on our "language problem." The most vital problem that has plagued Philippine education has been the question of language. Today experiments are still going on whether it would be more effective to use the native language. this indeed is ridiculous since the individual can not be more at home in any other language than his own. In every sovereign country, the use of its own language in education is so natural no one thinks it could be otherwise. But here, so great has been our disorientation caused by our colonial education that the use of our own language is a controversial issue, with more Filipinos against than in favor! Again, as in the economic field, Filipinos believe they can not survive without America, so in education we believe no education can be true education unless it is based on proficiency in English. "You ask for equal right,the Hispanization of your customs, and you don't see that what you are begging for is suicide, the destruction of your nationality, the annihilation of your fatherland, the consecration of tyranny! What will you be in the future? A people without character, a nation without liberty --everything you have will be borrowed, even your very defects! What are you going to do with castilian, a few of you who will speak it? Kill of your own originality, subordinate your thoughts to other brains, and instead of freeing yourselves, make yourselves slaves indeed? Niinetenths of those of those of you who pretend to be enlightened are renegades to your own country! He among you who talks that language neglects his own in such a way that he neither writes ot nor understands it, and how many have I not seen who pretended not to know a single word of it!" It is indeed unfortunate that teaching in the native language is given up to the second grade only and the question whether beyond that it should be English or Pilipino is still unsettled. Many of our education experts have written on the language problem, but there is an apparent timidity on the part of these experts to come out openly for the urgent need of discarding the foreign language as the medium of instruction inspite of remarkable results shown by the use of the native language. Yet, the deleterious effects of using English as the medium of instruction are many and serious. What Rizal said about Spanish has been proven equally true for English. Under the system maintained by Spain in the Philippines, educational opportunities were so limited that learning became the possession of a chosen few. This enlightened group was called the ilustrados. they constituted the elite. Most of them came from the wealthy class because this was the only class that could afford to send its sons abroad to pursue higher learning. Learning, therefore, became a badge of privilege. There was a wide gap between the ilustrados and the masses. Of course, many of the ilustrados led the propaganda movement, but they were mostly reformers who wanted reforms within the framework of Spanish colonialism. In a way, they were also captives of Spanish education. Many of them were the first to capitulate before the Americans, and the first leaders of the Filipinos during the early years of the American regime came from this class. Later, they were supplanted by the products of American education. One of the ostensible reasons for imposing English as the medium of instruction was the fact that English was the language of democracy, that through this tongue the Filipinos would imbibe the American way of life which makes no distinction between rich and poor and which gives everyone equal opportunities. Under this thesis, the existence of an ilustrado class would not long endure because all Filipinos would be enlighthened and educated. There would be no privileged class. In the long run however, English perpetuated the existence of the ilustrados....American ilustrados who, like their counterparts, were strong supporters of the way of life of the new motherland. Now we have a small group of men who can articulate their thoughts in English, a wider group that can read and speak in fairly comprehensible English, and a great mass that hardly articulate in their native tongues because of the neglect of our native dialects, if not the deliberate attempts to prevent their growth. The result is a leadership that fails to understand the needs of the masses because it is a leadership that can communicate with the masses only in general and vague terms. This is one reason why why political leadership remains in a vacuum. This is the reason why issues are never fully discussed, this is the reason why orators with the best inflexions, demagogues who rant and rave, are the ones theat flourish in the political arena. English has created a barrrier between the monopolies of power and the people. English has become a status symbol, while the native tongues are looked down upon. English has resulted in a bifurcated society of fairly educated men and the masses who are easily swayed by them. A clear evidence of the failures of English education is the fact that politicians address the masses in their dialects. lacking themastery of the dialect, the politicians merely deal in generalities. Because of their lack of command of English, the masses have gotten used to only half-understanding what is said to them in English. They appreciate the sounds without knowing the sense. This is a barrier to democracy. People don't even think it is their duty to know or that they are capable of understanding the national problems. Because of the language barrier, therefore, they are content to leave everything to their leaders. This is one of the root causes of their apathy, their regionalism or parochialism. Thus English which was supposedly envisioned as the language of democracy is in our country a barrier to the flowering of democracy. "The relation the Tagalog holds to the Bisaya or to the Sulu is very much like or closer than that of the Spanish to the Italian. An educated Tagalog from Batangas, and an educated Bisayan from Cebu can learn to understand each other is a short space of time and without much effort. A Cebu student living in Manila can acquire practical use and good understanding of Tagalog in less than three months. The relation between Tagalog and Malay is very much the same as that of Spanish and French." "Empirically neither the Spanish nor the English could be a suitable medium for public instruction in the Philippine Islands. It does not seem possible that either of them can become th common or national language of the Archipelago. Three centuries of Spanish rule and education failed to check the use of the vernacular. A very small minority of Filipinos could speak Spanish in 1898, but the great mass of the people could neither use nor understand it. But teaching English broadcast and enforcing its official use is one thing, and its adoption as the basis of education and as the sole medium of public instruction is a completely different matter...This point cannot be fully grasped or comprehended without special attention and experience in colonial education and administration. Such policy is exalted and ambitious to an extreme degree. It aims at something unknown before in human affairs. It is attempting to do what ancient Persia, Rome, Alexander the Great, and Napoleon failed to accomplish. It aims at nothing less than the obliteration of the tribal differences of the Filipinos, the substitution of English for the vernacular dialects as a home tongue, and making English the national, common language of the Achipelago." This is more true today. Very few college students can speak except in mixed English and the dialect. Our Congress has compounded their confusion by a completely unwarranted imposition of 24 units of Spanish. A foreign language is an impediment to instruction. Instead of learning directly through the native tongue, a child has first to master a foreign tongue, memorize its vocabulary, get accustomed to its sounds, intonations, accents, later to just discard the language when he is out of school. This does not mean that foreign languages should not be taught. Foreign languages should be taught and can be taught more easily after one has mastered his own tongue. Even if the Americans were motivated by the sincere desire of unifying the country through the means of a common tongue, the abject result of instruction in English through the six decades of American education should have awakened our educators to the fact that the learning process has been disrupted by the imposition of a foreign language. From 1935, when the Institute of National Language was organized, very feeble attempts have been made to abandon the teaching of English. Our educators seem to constantly avoid the subject of language, inspite of the clear evidence of rampant ignorance among the products of the present educational system. This has resulted in the denial of education to the vast number of children who after the primary grades no longer continue schooling. Inspite of the fact that the national language today is understood all over the country, no one is brave enough to advocate its use as the medium of instruction. There is the constant argument that new expenditures, new efforts in the publication of new textbooks will be involved. there are arguments about the dearth of materials in the national language, but these are feeble arguments that merely disguise the basic opposition of our educational leaders to the use of what is native. A foreign tongue as a medium of instruction constitutes an impediment to learning and thinking because a student first has to master new sounds, new inflctions, and new sentence constructions. His innermost thoughts find difficulty of expression, and lack of expression in turn prevents the development of thought. Thus, we find in our society a deplorable lack of serious thinking among great sections of the population. We half-understand books and periodicals written in English. We find it an ordeal to communicate with each other through a foreign medium and yet we have so neglected our native language that we find ourselves at a loss in expressing ourselves in this language.Language is a tool of the thinking process. Through language thought develops and the development of thought leads to the further development of language. But when a language becomes a barrier to thought, the thinking process is impeded or retarded and we have the resultant cultural stagnation. Creative thinking, analytic thinking, abstract thinking are not fostered because the foreign language makes the student prone to memorization. He is able to get a general idea but not the deeper understanding because of the mechanical process of learning. So, the tendency of the students is to study in order to be able to answer correctly and to pass the examinations and thereby attain the required credits. Independent thinking is smothered because the language of learning ceases to be the language of communication outside the classroom. A student is mainly concerned with the acquisition of information. He is seldom able to utilize this information for deepening his understanding of his society's problems. Our Institute of National Language is practically neglected. It should be one of the main pillars of an independent country. Our educators are wary about proposing the immediate adoption of the national language as the medium of instruction because of what they consider as opposition of other language groups. Thus it is an indicative of our colonial mentality. Our educators do not see any opposition to the use of a foreign language but fear the opposition to the use of the national language just because it is based on one of the main dialects. The fact that one can be understood in any part of the Philippines through the national language, the fact periodicals in the national language and local movies have a mass following all over the islands, show that given the right support, the national language would take its proper place. Language is the main problem therefore. Experience has shown that children who are taught in their native tongue learn more easily and better than those taught in English. records of the Bureau of Public Schools will support this. But mere teaching in the national language is not enough. there are other areas that demand immediate implementation. Philippine history must be rewritten from the point of view of the Filipino. Our economic problems must be presented in the light of nationalism and independence. These are only some of the problems that confront a nationalistic approach to education. Government leadership and supervision are essential. Our educators need the support of legislators in this regards. Is this connection the private sector has also to be strictly supervised. Before the Second World War, products of the Philippine public school system looked down upon their counterparts in the private schools. It is generally accepted that graduates of the public schools at that time were superior to the products of the private institutions in point of learning. There were exclusive private institutions that these were reserved for the well-to-do. These schools did not necessarily reflect superiority of instruction, but they reflected superiority of social status. Among students of the public schools there was an evident manifestation of concern for national problems. The nationalistic tradition of our revolution still was in the consciousness of those parents who were caught in the mainstream of the rebellion. On the other hand, apathy to national problems was marked among the students of the private schools. Today, public schools are looked down upon. Only the poor send their children to these schools. Those who can afford it, or those who have social pretensions, send their children to private institutions. The result has been a boom in private education, a boom that unfortunately has seen the proliferation of diploma mills. There were concomitant tendencies that went with this trend. First was the commercialization of education. A lowering of the standards resulted because of the inadequate facilties of the public schools and the commercialization of the private sector. It is a well-known that classes in many private schools are packed and teachers are overloaded in order to maximize profits. Second, some private schools which are owned and operated by foreigners and whose social science courses are handled by aliens flourished. While foreigners may not be anti-Filipino, they definitely cannot be nationalistic in orientation. They think as foreigners and as private interests.Thus the proliferation of private schools has resulted not only in lower standards but also in a definitely un-Filipino education. Some years ago, there was a move to grant curricula freedom to certain qualified private institutions as well as wider leeway for self-regulation. This was a retrogade step. It is true that this move was in answer to charges that state supervision would enhance regimentation. But in a country that is just awakening to nationalist endeavors, it is the duty of a nationalist administration to see to it that the molding of minds is safely channeled along nationalist lines. The autonomy of private institutions may be used to subvert nationalist sentiments especially when ownership of schools and handling of social sciences are not yet Filipinized. Autonomy of private institutions would only dilute nationalist sentiment either by foreign subversion or comercialization.While the basic defect in the educational system has been responsible for the lack of nationalist ideals, there are other media and facilities that negate whatever gains are made in some secvtors of the educational field. The most unlateral source of news, films, and other cultural materials tends to distort our perspective. American films and comics, American press services, fellowships to America, have all contributed tob the almost total Westernization of our attitudes. A distinct Filipino culture can not prevail if an avalanche of western cultural materials suffocates our relatively puny efforts in this direction. The education of the Filipino must be a Filipino education. It must be based on the needs of the nation and the goals of the nation. The object is not merely to produce men and women who can read and write or who can add and subtract. The primary object is to produce a citizenry that appreciates and is ocnscious of its nationhood and has national goals for the betterment of the community, and not an anarchic mass of peole who know how to take care of themselves only. Our students hear of Rizal and Bonifacio but are their teachings related to our present problems or do they merely learn of anecdotes and incidents that prove interesting to the child's imagination? We have learned to use American criteria for our problems and we look at our prehistory and our past with the eyes of a visitor. A lot of information is learned but attitudes are not developed. The proper regards for things Philippines, the selfish concern over the national fate --these are not at all imbedded in the consciousness of students. Children and adolescents go to school to get a certificate or diploma. They try to learn facts but the patriotic attitude is not acquired because of too much emphasis on forms.What should be the basic objective of education in the Philippines? is it merely to produce men and women who can read and write? If this is the only unqualified purpose, then education is directionless. Education should first of all assure national survival. No amount of economic and political policy can be successful if the educational program does not imbue prospective citizens with the proper attitudes that will ensure the implementation of these goals and policies. Philippine educational policies should be geared to the making of Filipinos. These policies should see to it that schools produce men and women with minds and attitudes that are attuned to the needs of the country. Under previous colonial regimes, education saw to it that the Filipino mind was subservient to that of the master. The foreign overlords were esteemed. We were not taught to view them objectively, seeing their virtues as well as their faults. This led our citizens to form a distorted opinion of the foreign masters and also of themselves, of our salvation, of our future. And unless we prepare the minds of our young for this endeavor, we shall always be a pathetic peole with no definite goals and no assurance of preservation.